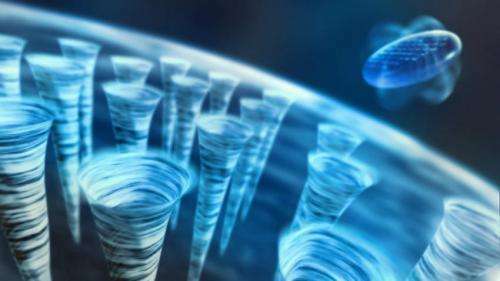 An experiment at the Department of Energy's SLAC National Accelerator Laboratory revealed a well-organized 3-D grid of quantum "tornadoes" inside microscopic droplets of supercooled liquid helium – the first time this formation has been seen at such a tiny scale. The findings by an international research team provide new insight on the strange nanoscale traits of a so-called "superfluid" state of liquid helium. When chilled to extremes, liquid helium behaves according to the rules of quantum mechanics that apply to matter at the smallest scales and defy the laws of classical physics. This superfluid state is one of just a few examples of quantum behavior on a large scale that makes the behavior easier to see and study. The results, detailed in the Aug. 22 issue of Science, could help shed light on similar quantum states, such as those in superconducting materials that conduct electricity with 100 percent efficiency or the strange collectives of particles, dubbed Bose-Einstein condensates, which act as a single unit. "What we found in this experiment was really surprising. 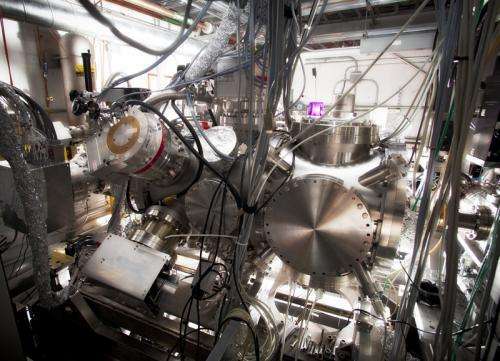 We did not expect the beauty and clarity of the results," said Christoph Bostedt, a co-leader of the experiment and a senior scientist at SLAC's Linac Coherent Light Source (LCLS), the DOE Office of Science User Facility where the experiment was conducted. "We were able to see a manifestation of the quantum world on a macroscopic scale," said Ken Ferguson, a PhD student from Stanford University working at LCLS. While tiny tornadoes had been seen before in chilled helium, they hadn't been seen in such tiny droplets, where they were packed 100,000 times more densely than in any previous experiment on superfluids, Ferguson said. Helium can be cooled to the point where it becomes a frictionless substance that remains liquid well below the freezing point of most fluids. The light, weakly attracting atoms have an endless wobble – a quantum state of perpetual motion that prevents them from freezing. The unique properties of superfluid helium, which have been the subject of several Nobel prizes, allow it to coat and climb the sides of a container, and to seep through molecule-wide holes that would have held in the same liquid at higher temperatures. In the LCLS experiment, researchers jetted a thin stream of helium droplets, like a nanoscale string of pearls, into a vacuum. Each droplet acquired a spin as it flew out of the jet, rotating up to 2 million turns per second, and cooled to a temperature colder than outer space. The X-ray laser took snapshots of individual droplets, revealing dozens of tiny twisters, called "quantum vortices," with swirling cores that are the width of an atom. The fast rotation of the chilled helium nanodroplets caused a regularly spaced, dense 3-D pattern of vortices to form. This exotic formation, which resembles the ordered structure of a solid crystal and provides proof of the droplets' quantum state, is far different than the lone whirlpool that would form in a regular liquid, such as briskly stirred cup of coffee. 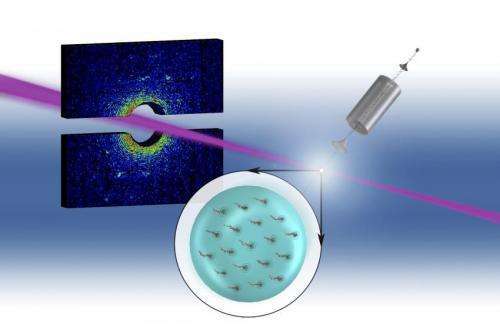 This is an illustration of analysis of superfluid helium nanodroplets. Droplets are emitted via a cooled nozzle (upper right) and probed with x-ray from the free-electron laser. The multicolored pattern (upper left) represents a diffraction pattern that reveals the shape of a droplet and the presence of quantum vortices such as those represented in the turquoise circle with swirls (bottom center). Credit: Felix P. Sturm and Daniel S. Slaughter, Berkeley Lab. Researchers also discovered surprising shapes in some superfluid droplets. In a normal liquid, droplets can form peanut shapes when rotated swiftly, but the superfluid droplets took a very different form. About 1 percent of them formed unexpected wheel-like shapes and reached rotation speeds never before observed for their classical counterparts. Oliver Gessner, a senior scientist at Lawrence Berkeley Laboratory and a co-leader in the experiment, said, "Now that we have shown that we can detect and characterize quantum rotation in helium nanodroplets, it will be important to understand its origin and, ultimately, to try to control it." Andrey Vilesov of the University of Southern California, the third experiment co-leader, added, "The experiment has exceeded our best expectations. Attaining proof of the vortices, their configurations in the droplets and the shapes of the rotating droplets was only possible with LCLS imaging." He said further analysis of the LCLS data should yield more detailed information on the shape and arrangement of the vortices: "There will definitely be more surprises to come." The presumptions of stochastic eigensvectors governing quantum physics mathematics are challenged by these exquisitely well ordered vortical formations.